Many people are asking me to compare the Brother HE-240 and the Brother SE-400. Actually, it’s confusing because there aren’t that many differences between the SE400 and the HE240. 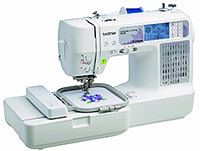 The Brother SE 400 Sewing and Embroidery machine is a newer machine that is identical to the older Brother HE240. The HE-240 is sold only by HSN. The SE-400 can be bought many places online and in retail stores. HSN’s price for the HE240 is a lot more than Amazon’s price for the SE-400. Amazon has the best price that I’ve found. HSN does include some extra accessories for the higher price. See below. The Brother HE-240 is an exclusive model sold only by HSN. Brother made the HE240 by adding an USB port to the SE350 before the SE400 came out. I don’t know if Brother added any tweaks to the newer SE400, but there are no essential differences between the two models. 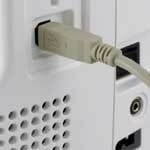 The SE400 does have the ability to upgrade the internal software through the USB port. 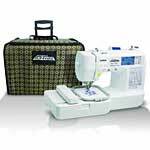 HSN does throw in a few extras such as a cording foot, narrow hem foot, piecing foot, and a very nice accessory case. But HSN charges $130 more than Amazon. If the extra accessories are worth the extra money to you, than buy the HE240 from HSN. But be sure to check the price of the accessories separately. If you only need one or two, you’ll be better off buying them separately. Another advantage of the Brother HE-240 is that HSN offers a monthly payment plan. Otherwise your best buy is the Brother SE400 from Amazon. 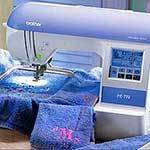 Either way, they are both great little machines, offering a lot of value for the money in a combination sewing and embroidery machine. Click here to see today’s price. Click here to check out the HE240 from HSN. I have a Brother HE-240 sewing machine. I have a 5” x 7” hoop or maybe a little larger. Can i change the size of the hoop I am using? If so, how? I am trying to print words going down the longer side of the hoop instead of words going across the shorter side. I would like to know if the Brother HE240 can use the 4×6 hoop also? If the HE240 and the SE400 are the same machine then it looks like I can use the 4×6 hoop. Although I don’t see this being possible. How would you tell the machine you are using a 4×6 pattern? I’ve done a lot of reading on this, but am not an expert, YES you can use multiple colors the machine will stop and wait for you to change the thread. not just two though, how ever many your pattern needs.